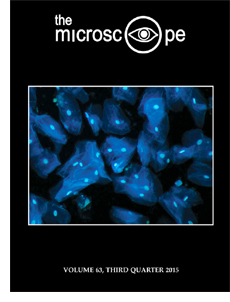 Fluorescence photomicrograph by Katie M. White of Microtrace, LLC shows buccal (cheek) cells stained with DAPI under ultraviolet light excitation. White’s image was the overall winner of the Inter/Micro 2015 Photomicrography Competition. See Inter/Micro 2015 on page 99. Excerpt: Anyone who has ever read The Microscope or used a microscope in any analytical way has probably considered the instrument’s long history or thought about what the future may hold for microscopy. Those of us who have practiced microscopy for some time can learn to appreciate the microscope’s origin, persistence and practicality. We also like to reflect on microscopists and their pursuit of the truth. ‘Even the best microscope becomes a boring toy in the hands of the inexperienced.’ Those were the words of German botanist, microscopist and microchemist Julius von Sachs more than 140 years ago. He emphasized that the successful use of the microscope is impossible without proper training. Excerpt: McCrone Research Institute’s 67th annual Inter/Micro microscopy conference was a pleasurable success this year, attended by leading microscopists and researchers from around the world. It was held on June 8 – 12 at McCrone’s lecture rooms and laboratories in Chicago. Participants heard in-depth research presentations by amateur, professional and graduate-student microscopists, who covered advancements in instrumentation, new techniques and practical applications in various fields of microscopy and microanalysis. Presentations focused on PLM, SEM, EDS, Raman microscopy, hot-stage and infrared microspectros-copy; microchemistry; forensic trace evidence and criminalistics; pharmaceutical sciences; materials analysis; environmental health; food analysis; and air quality. Excerpt: So, unknown Leeuwenhoek microscopes still exist? The remarkable revelation that three new examples have emerged has surprised many — none more than me. I was astonished in 1981, when I discovered that Leeuwenhoek’s original specimens still lay hidden among his letters in London, yet nobody expected more of his microscopes to emerge. These are dramatic developments, and the curious tales of double-dealing that surround them are remarkable. Each Leeuwenhoek microscope is unique and tells a fascinating tale. They are valuable, too; the single example that was recently sold on the open market cost half a million dollars. This scanning electron photomicrograph, pseudo-colored for 3-D viewing, shows gold-coated trichomes from the leaves of a lavender plant. 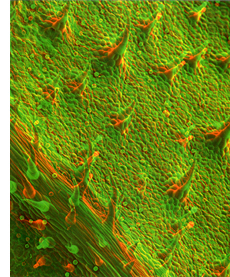 Fallon’s image was selected Best SEM Photomicrograph in the Inter/Micro 2015 Photomicrograph Competition.